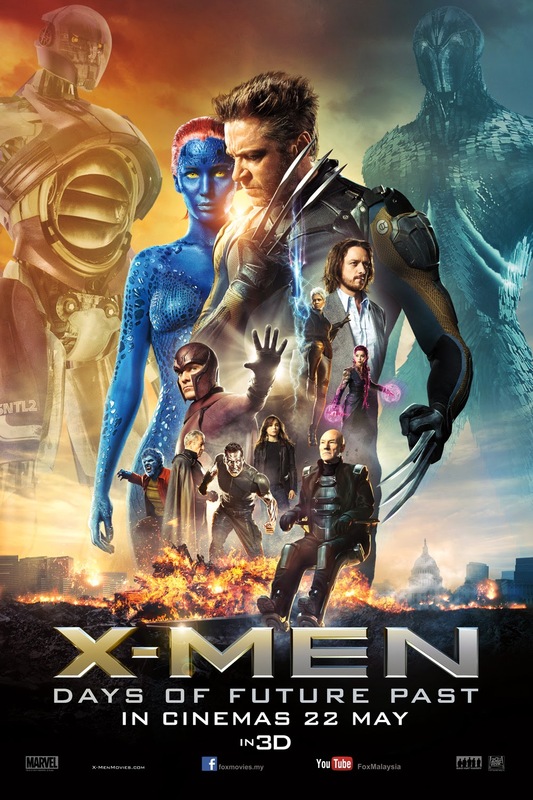 This seventh instalment of the X-Men film series takes place in 2023, years after The Wolverine (2013) where mutants are close to extinction being hunted down by the Sentinels, powerful army of giant robots invented to detect and destroy all mutants and any human being potentially with mutant genes. 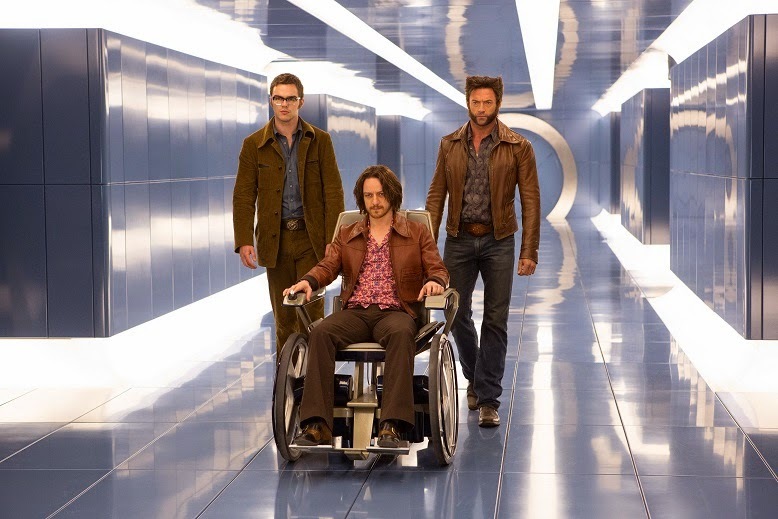 The remaining X-Men members, Professor X (Patrick Steward), Wolverine (Hugh Jackman) and Storm (Halle Barry) with Magneto (Ian McKellen) unites with a small group of survivors and plan to use Shadowcat’s (Ellen Page) phasing ability to send Wolverine back in time to stop Mystique (Jennifer Lawrence) from killing Bolivar Trask (Peter Dinklage), which was the trigger of the Sentinels program. It’s a 2-hour-and-10-minute film but it didn’t feel long at all. The pacing is fast, the plot is intense and the action sequences… how should I put it, IT’S THE REAL X-MEN ACTION WE’VE BEEN WAITING FOR, just like in the cartoon series I used to watch back in the 90s. The mutants featured here are very cool. Blink’s (Fan Bingbing) power of throwing out portals of teleportation is put to justice and utilised brilliantly in the fight sequences. 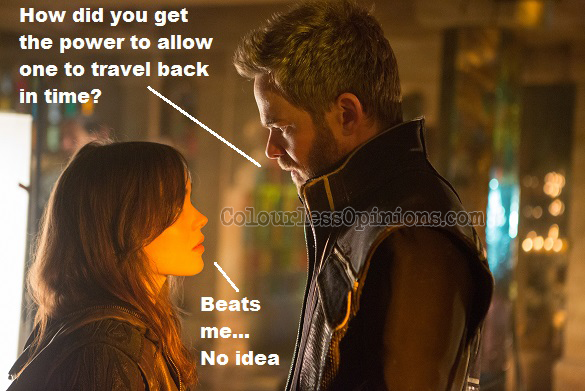 We get to see Iceman (Shawn Ashmore) sliding on all the ice he fires out of his hands. There’s also a very special slomo sequence to showcase Quicksilver’s (Evan Peters) crazy supersonic speed. There’re just too many great mutants here but due to time constraint, all of their screen time are limited. My only other complaint is that there’s just not enough of that awesome action they managed pull off, and most of time the good guys are losing. It would’ve been a complete pleaser if there were more scenes of mutants fighting the sentinels. Despite a bit of convenience and question marks here and there, the script is actually very tightly written in overall. The film has its own time travelling rules which avoided much of the typical paradoxes and loopholes, while linking the happenings from all of the instalments in the film series together very well, with the world’s historical events implemented as part of the story. All the back-and-forth to the past and future might be a bit too complicated for those who can’t keep up with the pace of the film, but I had no problem with it. Besides all that, the film is also very dramatic, emotionally engaging, nicely performed by the star-studded cast, and on top of it, not overly cheesy or corny. With all of this being said, I applaud both the director Bryan Singer and the screenplay writer Simon Kinberg for this… best X-Men instalment. Post-credit scene? Sequel? Yes, there is very brief scene after the entire closing credits. [SPOILERS UNTIL THE END OF THIS PARAGRAPH] En Sabah Nur a.k.a. Apocalypse, one of Marvel’s greatest villains is shown using his powers to build one of the wonders of the world, the pyramid, with the Egyptians beneath him bowing and worshiping him like a god. With all the characters brought back to life, Wolverine has no adamantium claws again (how he got it back after the events of the previous instalment is not explained) and Channing Tatum confirmed to play Gambit, I think the sequel’s going to be epic. It might even be in between the timeline of the ending of this instalment, which would allow Wolverine to reboot as well for a wilder personality that’s more faithful to the comics. The question is, now that the history has changed, will Wolverine have adamantium in him? It’ll be interesting to see how they’ll play it out. Censorship in Malaysia: Besides the F-bombs, nothing else is noticeably cut at the corporate screening organised by GSC. To watch in 3D: I didn’t get to watch it in the format but I believe if the depth is done right, it’d be pretty impactfully cool. Second opinion: My girlfriend liked it very much but thought that there wasn’t enough character struggles (which I completely disagree), a bit convenient and felt that it could’ve been more epic. Verdict: One of the best, if not the best, instalment of the X-Men film franchise thur far, setting up future sequels that the fans will be eagerly anticipating to watch, myself included. Personal favorite scene : Quicksilver's slo-mo and the annihilation during the first scene before someone got sent back. Wolverine will get his metal back (linked back to X-Men 2). Just saw this blogger section! Wolverine will get back his claws in 1980s after Stryker's experiments on him. Film is set in 1970s and at that time Wolverine had no metal in him. But the history has changed and the Stryker at the end was Mystique. If it still happens, that would mean Mystique is still evil. 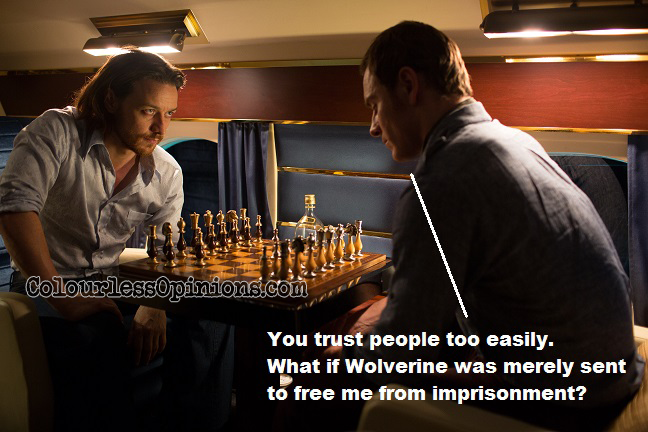 Anyway, if he does get back the adamantium, we hope that would be explained in the sequel because they did not explain how he got back the metal to his claws after what happened in The Wolverine (previous instalment).